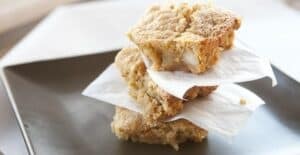 Soft and flaky blondies made with Bob’s Red Mill almond meal. Packed with macadamia nuts and white chocolate chips. Naturally gluten-free! 1) Preheat oven to 300 degrees Fahrenheit. Whisk together dry ingredients in a medium bowl (almond meal, corn starch, baking powder, and salt). 2) In a slightly larger bowl, beat together eggs, melted and cooled butter, and sugar until it’s an even consistency. 3) Stir dry ingredients into wet ingredients. Once combined, fold in nuts and chocolate. 4) Lightly butter an 8×8 baking dish and transfer batter to dish. 5) Bake blondies for 35-40 minutes at 300 degrees Fahrenheit. Baking them at a lower temperature prevents the almond meal from burning. 6) When done, let cool for 10 minutes before slicing and serving. The blondies should continue to setup as they cool. If they are really wet still, store them in the fridge for an hour and they should firm up nicely. This delicious recipe was brought to you by Macheesmo. Read the full post at https://wp.me/pkSYO-97K.